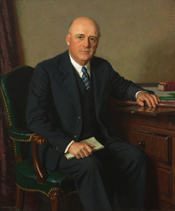 Sam Rayburn had his portrait painted by British artist Douglas Chandor shortly after his election as Speaker. 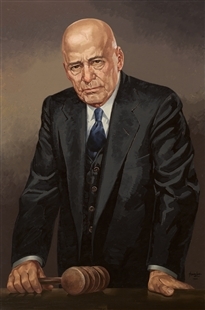 Chandor, who also painted Winston Churchill and Queen Elizabeth II, held sittings with Rayburn early in the morning and late in the evenings, after the House adjourned. This arrangement reportedly created challenges for the artist. The light changed from morning to night, and Rayburn’s appearance changed too, from the exhausting work of legislating all day. Three versions of the portrait were completed—for the Capitol; for Rayburn’s alma mater, East Texas Teacher’s College; and for the Texas State Capitol in Austin.